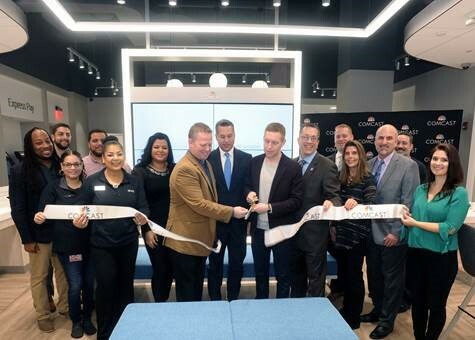 HOLYOKE, MA – (November 20, 2018) – In time for Black Friday and holiday shopping, Comcast today held a ribbon-cutting ceremony to celebrate the grand opening of its newest Xfinity Store, which is conveniently located on the upper level of the Holyoke Mall. The 4,691-square-foot space is the first Xfinity Store in the region to open in a mall setting and is focused entirely around the needs of customers. Consumers will have the opportunity to explore, learn about and interact directly with the latest Xfinity products and services, including Xfinity Mobile. In addition, the store offers a dedicated space where Comcast Business customers and prospects can discover cutting-edge business solutions and get connected with a local expert to discuss their business technology needs. Local officials and community leaders, including Holyoke Mayor Alex Morse, State Representative Aaron Vega, City Council President Todd McGee, Ward 3 City Councilor David Bartley, Ward 2 City Councilor Nelson Roman and Greater Holyoke Chamber of Commerce President Barry Feingold, came out to celebrate the grand opening and tour the new store. At the new Xfinity Store in the Holyoke Mall, customers will receive personalized service from 12 trained and knowledgeable Sales Consultants at the. The store is the second of its kind in Western Massachusetts and is conveniently located within the Holyoke Mall at 50 Holyoke Street and is open Monday through Saturday from 10 am – 9:30 pm and on Sundays from 11 am – 6 pm. The opening of this interactive Xfinity Store is part of Comcast’s multi-year journey to transform its customer experience and create a culture focused on exceeding customers’ expectations, at all levels of the company. The Holyoke Mall store features flat-screen HDTVs, interactive iPads, a comfortable seating area and strategically designed product areas— Xfinity X1, Xfinity Internet, Xfinity Home and Xfinity Mobile—so customers can see the industry-leading products in action. The store is also the first in the region to incorporate Comcast’s retail technology enhancements, including: the Xfinity Internet Zone, where customers can discover Xfinity xFi, a digital dashboard that lets customers personalize, manage and control their home Wi-Fi experience; and the Connected Home Zone, which showcases how Xfinity Home combines the best of home security and automation into one simple experience.